This week: Soraa expanding its line of large LED lamps, Milan street lights are going LED, and the size of the OLED market in five years. That's according to a market research report from Nanomarkets. (The report costs $3,295 for one user.) By 2019, the analyst firm believes that residential OLED luminaires will be a $400 million business, with office luminaires worth almost $380 million in revenue. Here's a question for this community. In residential LED incandescent replacement light bulbs, there seemed to be fair agreement on what would be required for the market to take off: price under $10, warm white/2700K CCT, reasonably omnidirectional light distribution, not too weird-looking. 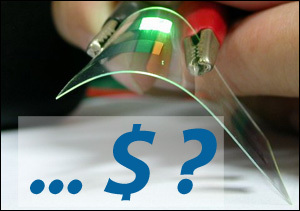 The question is, What will the magic point be for OLED luminaires? Let's take a hypothetical 20cm x 20cm OLED panel built into a luminaire. How many lumens must it emit? With what efficacy? With what color stability? At what price? The 142-year-old testing and certification organization is using the occasion of Lightfair to spread awareness of its broad range of testing services for every corner of the lighting business. Founded in 1872, eight years before Edison was granted his light bulb patent, TÜV Rheinland now operates six testing labs in the US (on both clasts), four in Europe, and six in Asia. Among the standards TÜV Rheinland test to are (inhale): UL 1598, UL 153, UL 2108, UL 1993, UL 8750, IEC/EN 60598 series, IEC/EN 61347 series, and IEC/EN 62031 for product safety, and FCC 47 Part 15B and Part 18, EN 55015, EN 61547, EN 55022, and EN 55024 for EMC. Some here have wondered how Soraa could support an R&D-heavy business on sales of MR16 lamps, which was their initial product line. The company has now put out a press release promising that they will show a broad line at Lightfair next month, including AR111, PAR30L (long neck), PAR30S (short neck), and PAR38 lamps. It's not quite on the scale of Los Angeles (141,000 lights so far) or New York (250,000), but the Italian city of Milan is changing out 84,000 street lights for new ones based on LEDs. It's just part of a much broader renovation of the city in preparation for hosting Expo 2015, the International Exhibition, next year. The exposition's theme is Feeding the Planet, Energy for Life. The winning bid was submitted by AEC Illuminazione srl, which splashes the news all over its front page, of course. But the link leads only to a locally hosted Google translation of a press release.